Mac-Nutrition is an established nutrition consultancy, providing nutritional services to the general population, corporate sector and sporting bodies, teams and individuals. The successful applicant will work closely with the Mac-Nutrition team both on external contracts and in-house projects. 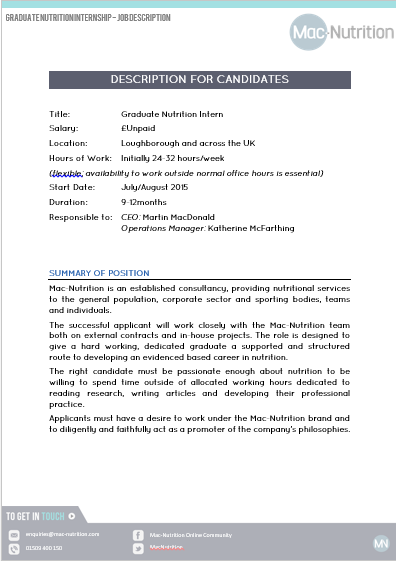 The role is designed to give a hard working, dedicated postgraduate qualified individual a supported and structured route to becoming a sought after nutrition specialist and gaining employment as an integral part of the Mac-Nutrition team at the end of the 9-month internship period. The right candidate must be passionate enough about nutrition to be willing to spend time outside of allocated working hours dedicated to reading research, writing articles and developing their professional practice. Applicants must have a desire to work under the Mac-Nutrition brand and to diligently and faithfully act as a promoter of the company’s philosophies. To find more details: Please download the nutrition internship job description for this exciting opportunity below. 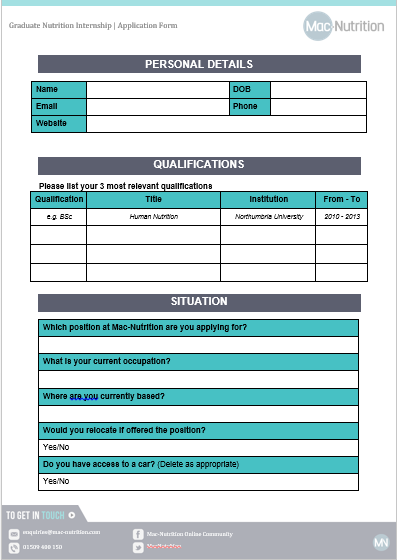 To apply for this position: Please click and download the below application form.